The Atlantic Recording Corporation (New York City, NY) started in 1947 and is best known for its numerous recordings in the fields of rhythm and blues, rock and roll, jazz, gospel and more. Important names connected to the Atlantic board include Herb Abramson (who sold his interest c. dec. 1958), Miriam Abramson, Ahmet Ertegun and Jerry Wexler. Atlantic bought recordings (both gospel and secular) from Therman Ruth (Selah Jubilee Singers) in 1949, recorded in 1948, but nothing was released. Lavern Baker recorded intensively for Atlantic, but LP 8036 is her only gospel LP for the label (a 45, drawn from this album, was released on Atco). 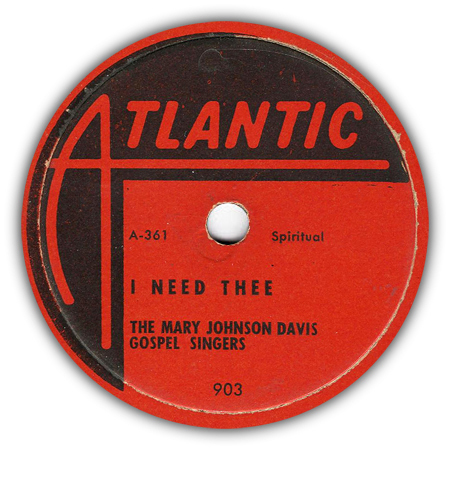 This page lists all known Atlantic gospel singles (1949-1970) and LP releases (1959-1975).